In a microwave safe bowl add chopped beans, corn and peas. Add 1 spoon oil and little salt and cook for 10 minutes. Now add these veggies to dosa batter and also add grated carrot. Mix well.Heat the ponganalu pan spray or apply some oil to it. Now add 2 spoons of mixed batter. Cover with lid and cook for 3 minutes on medium flame. Remove lid and turn the ponganalu and repeat the process. Remove and serve hot or at room temperature with any chutney. My kids love to have these with ketchup so u can even try it. Sending this recipe to Radhika's Lets cook kids special event.Also sending this recipe to Kids delight-what kids love event hosted by Vardhini. Peel off the skin of raw banana and slice the banana into thin slices and let them rest in water for few minutes. Add salt, chili powder, haldi and soda to besan and mix well. Now add little water at a time to make smooth paste . Now heat oil in deep frying pan. Now transfer the banana slices into tissue paper or dry cloth to remove the water. We have rested the slices in water as the banana slices tend to become black when left as they are.Now dip each slice into batter and drop one by one into hot oil and fry till golden brown on medium flame. Remove and serve hot with ketchup or any sauce. Wash chilies and pat dry them. Slit the chilies in between and remove seeds. Make a paste of peanuts, sesame seeds adding salt and tamarind paste. Fill this paste inside the slit green chilies. Add salt, chili powder, soda, haldi to besan/ gram flour and mix well. Adding water make a smooth paste. Heat oil for deep frying. 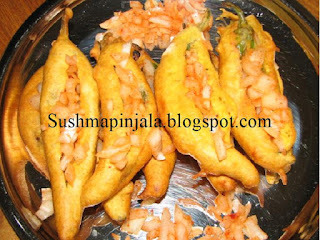 Now dip the chilies in besan and drop 3 or 4 at a time in oil and fry till golden brown or crisp. Add little chili powder to chopped onion and keep aside. 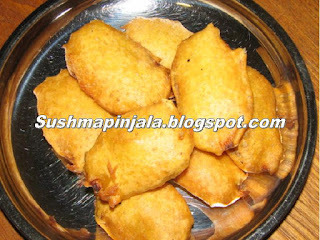 Now remove fried chili bajji from oil and rest them on paper towel. Wait for 2 minutes and slit the bajji's again. Fill the chopped onions and sprinkle little lime juice on top. Yummy mirchi bajji's are ready to serve. Sending this recipe to Sumee's Bon Vivant event. In a bowl add salt, haldi, chilli powder and mix with besan and rice flour. Now add water to make batter. The batter consistancy should be not too thick nor too thin. Mean while cut bread slice to 4 pieces. 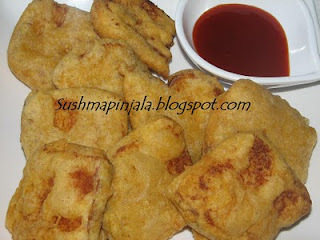 Now dip each bread piece in the batter and deep fry in the hot oil. Keep turning so that they are evenly cooked on all the sides. I added rice flour instead of bicarbonate soda, because, if u add soda the bread bajji consumes lot off oil. 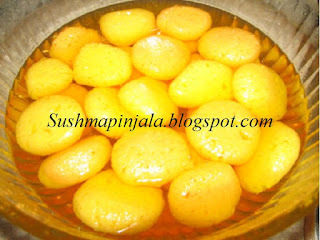 If u add rice flour oil is not consumed much and the outside crust is also crispy. Fry all the bread pices some at a time and serve hot with any chutney or sauce. Sending this recipe to Tickling Palates event Let's cook Kids special. Soak masoor dal for atleast 6hrs. Grind 3/4 of this dal to fine paste. Add rest of the dal , rice flour to the paste. Chop onion, green chillies, curry leaves and cilantro and add to the dal. Add salt and bicarbonate soda. The consistency should be as any other vada batter but should not too smooth. 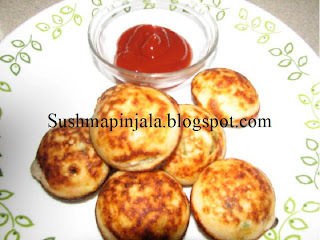 Heat oil in pan and make small vadas and fry till golden brown. 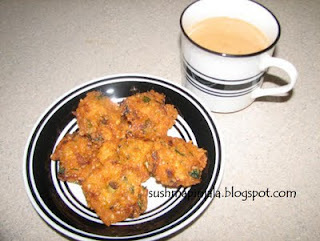 I love to have these vadas with evening tea. 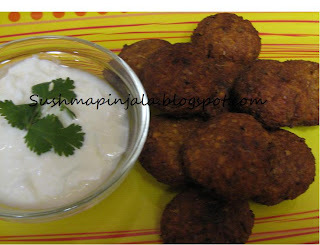 Add water to falafel powder and mix well. Cover and leave it for 2hours. Heat oil in deep frying pan. Make small dumplings or balls with the mixture and deep for for 1 minute on high and 3 to 4 minutes on medium flame till golden color or crisy. Serve hot with pita bread or tarator sauce and vegetables. Add oil to warm water and mix it well with khaman mix. Mix small amount of water at a time to avoid lumps. Now add the masala powder given with the packet. Mix well.Take a round deep vessel and grease it with cooking spray or oil.Pour the batter into the vessel and cover with cooking vessel / lid and steam on high for 15 to 20 minutes. Remove from flame and cool. For garnishing make a tempering. Heat 2 spoons of oil and add mustard seeds, asafetida and cut green chilies. Spread this tempering evenly on the cooked khaman. Garnish with chopped cilantro and cut them into square or what ever shape u want. Serve as it it or with green chutney. 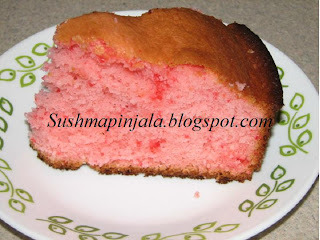 Take a mixing bowl and add cake mix, water, eggs and oil. Mix well with hand mixer or blender. Take a baking tray any shape of your choice. Grease the tray with cooking oil or butter. Now transfer the cake mix into the tray and bake on 350 degrees F for 30 to 35 minutes or till done. Let the cake cool to room temperature. Now its ready to serve. U can serve as it is or apply some icing and serve.